Preheat oven to 150°C (300°F). Place the eggwhite in the bowl of an electric mixer and whisk until stiff peaks form. Gradually add the sugar, whisking well, until the mixture is stiff and glossy. Add the cornflour and vinegar and whisk until just combined. Shape the mixture into 2 x 18cm rounds on baking trays lined with non-stick baking paper and sprinkle with the almonds. Reduce oven to 120°C (250°F) and bake for 1 hour. Turn the oven off and allow the pavlovas to cool completely in the oven. Whisk the cream until soft peaks form. Spread half over a pavlova, sandwich with the remaining pavlova and top with remaining cream. 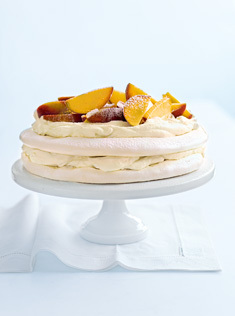 Place the peach and dessert wine in a bowl, toss to combine and place on pavlova. Serve immediately. Serves 8–10.